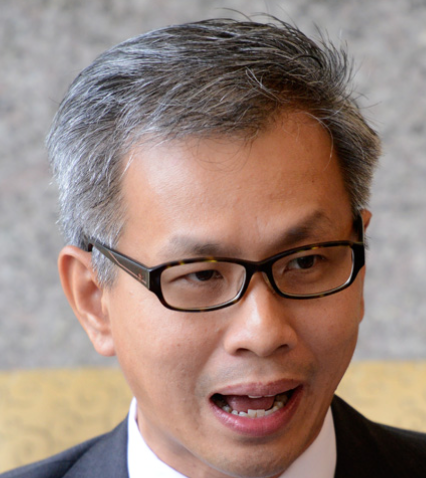 YB Tony Pua threatens to sue whistleblower, openly accuses BN of paying Lester to frame him. p.s. YB Rahman Dahlan tak nak sue Tony for slander? 21 July: For someone the alleged plotters described as "not credible", their response to Lester anak Melanyi's video confession on the Plot to topple Najib Razak has been, er, incredible. The aid plotters - from the Sarawak Report to lovers of the Sarawak Report - are behaving seperti kera kena belacan (like a cat on hot bricks). One prominent YB implicated by this Sarawakian whistle-blower is threatening a lawsuit even! If this Lester the "disgraced" former Editor is not credible, the YB and fellow alleged plotters and their lovers and defenders shouldn't get all worked up. Chill. Or people like me will start thinking there might actually be some truth in what Lester is trying to say. If the messenger is disreputable, what is the credibility of the message? Tony Pua should and will sue unless poor pathetic Lester begs him not to. Crime does not pay, and perhaps so does defamation isn't it ? I think further "financial adventures" of someone three feet tall and three metres wide are about to emerge soon. Pls. get Lester and the NGO coolie to get Parts 3 and 4 up and running by next week. You must be accessing different media sources, Rocky. From the reports that I have read, Sarawak Report/Clare Rewcastle Brown have been rebutting or refuting the comments made by Lester. If Lester is standing by his allegations, he should put them in a signed Statutory Declaration that can be used as a basis for any further legal action. The government can sue Ms Brown and the Sarawak Report in the British courts on any number of grounds. I note that the WSJ reports are still out there in the public domain. They have not been retracted and the paper has not apologised for publishing the reports. If they (the lawyers are 100% convinced that they have a rock-solid case against the WSJ, they would have gone ahead and sued the paper. p.s. YB Rahman Dahlan next time try not to completely make an idiot out of yourself by working with substandard machas. p.s. that poor innocent transport manager in the UK can sue both Lester and Dalang, by the way. "perhaps is to request Dato’ Seri Rahman Dahlan to foot his legal bills." ". One prominent YB implicated by this Sarawakian whistle-blower is threatening a lawsuit even! If this Lester the "disgraced" former Editor is not credible,"
And here you ask this YB to chill? One rule for UMNO/BN MP's and one rule for everyone else? Of course lah Tony Pua will sue, you sue when you have nothing to be afraid of. Tony Pua the "hero". Don't be a zero. Just deny you ever meet Justo. Suing in court will take years to endo. Why you can't even deny meeting Justo? Or is it true both of you are in communico? In Bangkok or Singapore with the Australiano. Jibby lovers love Lester......penghina Nabi! Hei Tony Pua, pergi mampus la kau!! Now, Datuk... What say you? Tony Pua was paid by Ultrakiasu DAPig bizmen and politician to hatch plan to criminalise PM and indirectly UMNO . The plan was almost perfect with the involvement of many politician within and outside the ruling circle . Hold and behold ... Justo pop out ... then Lester crack out .... all occuring in the holy month of Ramadhan . It looks like The Almighty have given rahmah to PM Nagib . So now somebody else is wriggling . Are children running The Mole now? What does "topple Najib" mean? I don't get it. Not all of us want to sweep an Everest of dirt under the carpet just because the PMO pays us a nice juicy monthly fee. 30 million folks have a right to know. Najib has a right to clear his name. He ain't doing it. It's been close to 8 months. What the hell is "topple"? The only thing that will fall over is the whole crooked system, and I'd guess a majority of those 30 million folks will be pretty shocked at what lay underneath, half hidden from view. Sorry, This Time We Are Going To Have To Sue! Sarawak Report takes a tough tone in many of its stories, especially when revealing corruption in high places. So we are generally phlegmatic about the often angry rebuttals we sometimes get. Usually, we rely on the facts to make our case against detractors and allow readers to decide by comparing those facts with the criticisms against us. However, over the past days, certain characters who claim to represent the government and their friendly media outlets have gone too far. They have paraded a sick and discredited individual, who has poured out strings of lies, which none of them have sought to check out, in order to claim this as “proof” that our research was all “forged”. This would be entertaining for being so ridiculous, given the mass of evidence that supports all we have written. But ministers have now used this character and these ludicrous libels as an excuse to order an internet ban on Sarawak Report. BN’s so-called strategic communications chief, Abdul Rahman Dahlan, a minister for housing, has on the same grounds outrageously libelled the writer, calling her “scum” and labelled our research as “blatant lies”. This is despite the fact that all our articles have been closely researched and substantiated. Moreover, numerous other publications have supported our findings and repeated our conclusions in the global media. Mr Dahlan has not produced a single shred of evidence that would lead anyone to believe the ravings of the mentally unbalanced bankrupt, Lester Melanyi. We therefore accuse Mr Dahlan of criminal libel, motivated by malicious intent. We are consulting our lawyers with a view to reporting him to the Malaysian police authorities and also issuing libel proceedings against him and other parties, including the New Straits Times and other publications which have deliberately promoted falsehoods designed to damage the credibility of Sarawak Report. We will also report Mr Melanie’s vicious criminal libel to the local police (he’s not worth suing) and we warn him and anyone who continues to promote his present and future made up stories that we will seek appropriate damages. why like that one you? why you did not publish my very fair analysis and comment on your writeup? "One prominent YB implicated by this Sarawakian whistle-blower is threatening a lawsuit even! If this Lester the "disgraced" former Editor is not credible, the YB and fellow alleged plotters and their lovers and defenders shouldn't get all worked up. Chill. Or people like me will start thinking there might actually be some truth in what Lester is trying to say. " One "ProMinet leader" implicated by this "WorldStdJournal" whistle-blower is threatening a lawsuit even! If this "Journal" is not credible, the leader and fellow "lower down leaders" and their lovers and defenders shouldn't get all worked up. Chill. Or people like me will start thinking there might actually be some truth in what the Journal is trying to say. There people, I've uncoded the message this "think-he-is-a-smartalex" Rocky fella is trying to tell all of us! Without doubt rocky, you are really a "mou liew tou" newseditor. why? what kind of question is that. rocky won't comment on Rosmah acc etc etc. why? confirm dah masuk duit dlm pocket la tu. so directly or indirectly.. rocky pon dah makan duit rakyat. Rocky, saya sebelum ini amat menggemari penulisan2 Rocky. Tetapi selepas posting rocky bertajuk Just 3 questions, saya berasa kasihan pada Rocky. Nampaknya, Rocky juga terkena tempiasan Sang Kelembai...1MDB. Have been waiting for part 3 of the video by bankrupt Lester, or is he waiting for his pay check from Kota Belut MP?